“Zelda,” is, it turns out, the name of the Zhumell Z10 Dobsonian who has come to stay with me. Sounded right; like F. Scott’s paramour, the telescope seemed saucy and a little scatterbrained. She did, however, soon begin to reveal solutions to some of her apparent quirks and I made a few improvements for Second Light. Improvement One, as mentioned last week, was providing her with a zero power finder to use at least as a supplement to the included Right Angle Correct Image 50mm optical job. A visit to the Scopestuff website got a Rigel Quick Finder base on the way to me from Texas. Not that the included finder is bad. It is actually nice and sharp; I just prefer to have a zero power sight (at least) in addition to an optical finder. By the way, if there are any of you out there who still haven’t used the Chinese 50mm finders, when you encounter your first one be aware they focus by screwing the objective cell in and out after loosening the knurled ring behind it. I’ve seen quite a few folks over the years suffering with out of focus finders who didn’t know that simple trick. The finder base arrived, amazingly, in just two days and I immediately mounted it to the OTA using the included double-sided foam tape. Where? There was just enough room to squeeze the Quick Finder in between the focuser and the finder scope thanks to the Rigel’s relatively small size and upright orientation. I thought I’d be able to easily shift my eye from finder or main eyepiece to the Quick Finder while seated in my adjustable seat observing chair. 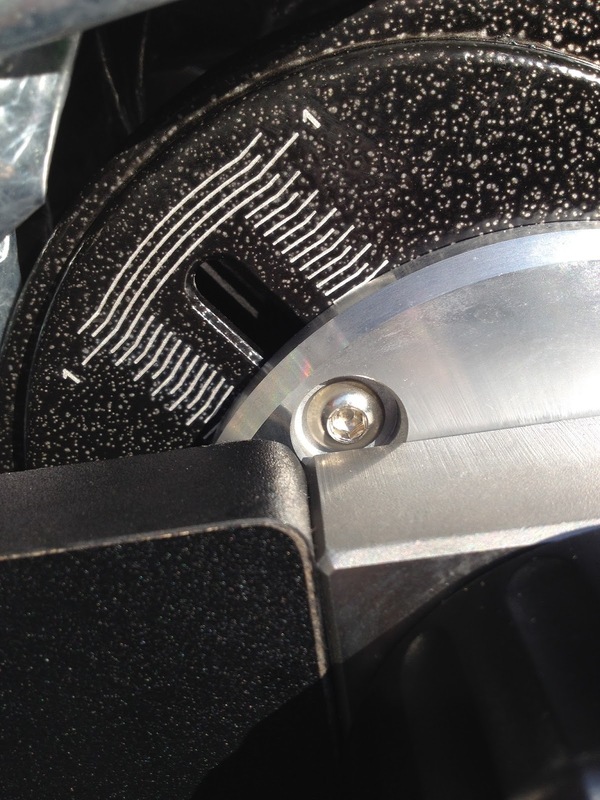 It seemed the second of the focuser’s two lock/tension screws, the one closest to the focuser’s base, was preventing the draw-tube from reaching its full extension. Loosening it all the way yielded what looked to be half an inch or a little more of additional travel. I’d already ordered a 2-inch extension tube from Scopestuff before I read about this “trick,” but that was OK. I wasn’t sure my Ethoses, which I’d had to use in the focuser's 1.25-inch adapter, would come to focus in 2-inch mode with just another ½-inch of added back travel. 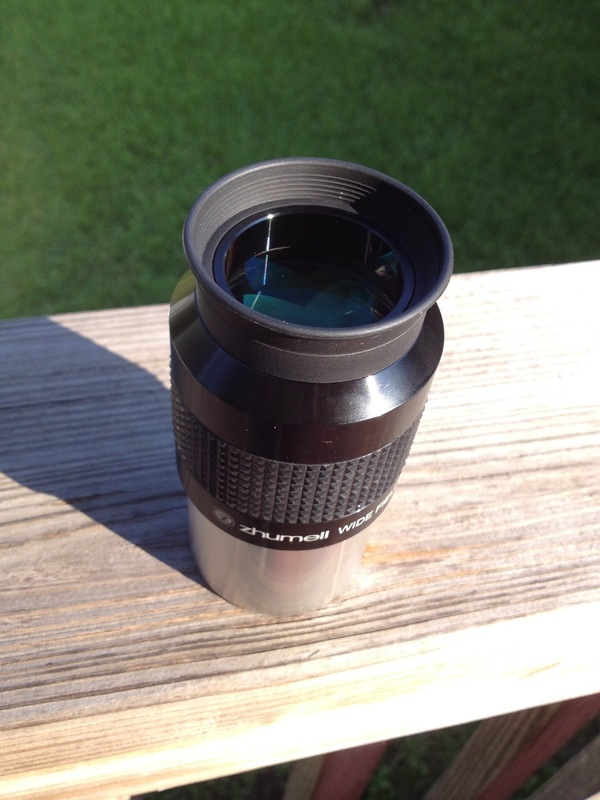 Otherwise, what was the story with the included Zhumell 2-inch 30mm wide field eyepiece? As I may have mentioned last time, it works OK. The AFOV, when compared to my Panoptics, seemed to be about 65 degrees or so: nice and wide but not ultra wide. Stars were reasonable at the edge of the field even at f/5. No, it ain’t no Ethos apparent-field-wise, much less edge-of-field sharpness-wise, but is a good compromise and is nicer than cheap 82-degree oculars like the 1RPD eyepieces. Nicely coated. Not very heavy, either. I also tried the laser collimator. It appeared to be in collimation itself, and while it didn’t really produce a red dot—more like a short red bar—it allowed me to collimate the scope at least as well as I could with my Cheshire/Sight Tube in low light. Or really in any light with my eyes. There are several mods that can be done to improve the laser, which are linked to the above CN thread, and I resolved to try some of them. Still, it seemed to work. Naturally, First Light was followed by days of intermittent rain and almost continuously cloudy skies. It appeared we would get a temporary break, however, and though the eyepiece extension tube had not arrived, I wanted to give Zelda her Second Light. My goals were not complex. No serious visual observing projects. I just wanted to further test the new telescope. See what additional tweaks I might need to make, how what I’d done so far worked, and, most of all, see how she performed. Was the focus travel problem solved for all eyepieces by loosening the lock knob? How good was the collimation produced by the laser? Was balance affected by the addition of the Rigel Quick Finder? Was the position I placed the Quick Finder in on the tube one that would make it easy to use? How did DSOs, even just bright ones, look in the scope as compared to in the 8-inch f/5? What would I think about this new telescope after using her for several hours? I didn’t get the chance to find any of that out Wednesday night. While my usual observing weather sources, TWC, the Clear Sky Clock, and Scope Nights, predicted I’d get some time under the stars, and I’d gone ahead and set the Zhumell up in the backyard, by sundown it was raining again. I watched Star Wars: Clone Wars Season Three on Netflix and fumed. I kept poking my head out the door, but nothing had changed by 10 p.m. and I eventually had to admit it looked like nothing would change Wednesday evening. Thursday morning, for want of anything better to do, I thought I’d fine tune the scope’s balance. It appeared we might finally get that predicted clearing a little behind schedule Thursday night, and I wanted to be ready for it. I’d be conducting my astronomy club’s monthly meeting early in the evening and I wanted to get to work with the new telescope as soon as I got home. To that end, after a couple of cups of coffee, natch, I joined Zelda in the backyard where I’d left her set up and covered with a Desert Storm cover. 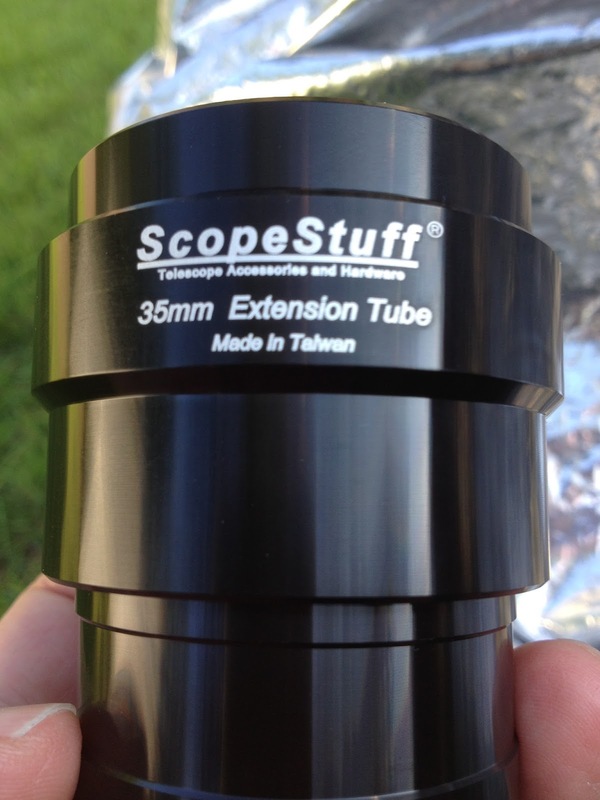 As a first step, I checked the scope’s balance with my heaviest frequently used eyepiece, the 13mm Ethos (1.3-pounds). With the tension knobs on both altitude bearings loose, the tube took a nosedive when Zelda was pointed lower than about 30-40-degrees. The Zhumell's sliding-bearing altitude balance system is downright innovative, but you can’t adjust it with the OTA on the mount, unfortunately. So…I pulled the tube off the rocker box, loosened the four Allen head bolts that hold the alt-bearings in place, and slid them up the scale another half inch toward the forward end of the tube. Tightened everything back down, remounted the OTA, and gave it a try. With some tension on the knobs, balance was good with any of my normally used oculars. Not perfect, mind you. Unless you have a means of continuously adjusting balance, the altitude axis of an alt-az scope, given the (too) small side bearings Chinese telescope makers use, will never be perfect all the way from 90-degrees to 0-degrees. Still, I ruled it good enough as long as I kept at least one of the tension knobs cranked down. I may look into getting some magnetized welder’s weights to place on the tube, if necessary. That’s the usual solution for today's steel tube Dobs, and is the successor of the lead-shot-filled beanbags we stuck on our Sonotube scopes with Velcro in the 1990s. As soon as the club meeting wrapped up, I made tracks for home, but I needn't have hurried. Darkness still hadn’t arrived —darn this DST—when I made it back just after 8. I spent another half hour or so watching TV until Venus and Jupiter peeped out, and kinda had to pry myself off the couch, I’ll admit, when they did. I’d had a pretty good time running the Mobile Astronomical Society June meeting, but the glasses of Merlot I’d consumed with dinner at Applebee’s beforehand to fortify myself for the task were now having a slightly deleterious effect. Still, I was determined to see where I stood with the new scope’s focuser and Rigel Quick Finder at least. When semi-darkness arrived, I centered brilliant Cytherea in the finder, inserted the 30mm Zhumell ocular, and looked in it to see a just slightly blurry (more blurry than could be attributed merely to those glasses of vino) planet. Gave it a little more out focus, little more, and bingo, the Sun’s second world became a sharp little half-moon. The laser-produced collimation looked good and I actually had a little out focus distance to spare. Before going on to try my other problem eyepieces, the Ethoses, I aligned the Rigel Quick Finder to the scope, and tried my dual-threat finding system on Jupiter. Verdict? Sure was nice to be able to see where I was pointing the freaking OTA. I’ve never got the hang of using right angle finders and guess I never will. The position of the Rigel on the tube seemed just about perfect to me. OK, Jupiter now. Obviously the planet would benefit from a lot more magnification than the 30mm was delivering, 41x. Hopped inside and retrieved the 8mm Ethos, plugged it into the focuser, and, as I feared, it still wouldn’t quite come to sharpness in 2-inch mode. Not a biggie. I added the scope’s 1.25-inch adapter and the TeleVue eyepiece then worked fine. Jupiter was showing off plenty of cloud bands when the seeing cooperated in the gloaming. Final task was to see where the 13mm Ethos’ focus would fall. Like the the 8mm it is a hybrid 1.25-inch – 2-inch ocular, but I recalled it doesn’t focus quite as far out as the 8. Sure enough, I had just enough range to bring it to focus in 2-inch mode, just barely enough. As for the 8mm, I’d have to make up my mind whether to continue to use the eyepiece with a 1.25-inch adapter or, when it arrived, leave the 2-inch extension tube in the focuser at all times. Assuming of course that even the extension would put the eyepiece far enough back. What else did I find out before throwing in the towel? Balance seemed near perfect with all eyepieces. 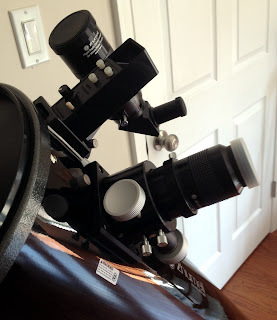 Only when I added my 2-inch TeleVue Big Barlow to the 8mm did the scope display any tendency to plunge to the horizon, and cranking down both altitude tension knobs made the Barlow-8mm configuration (312x)—which was perfect for Jupiter—eminently workable. What else did we do on Second Light night? That was about it. I did mosey over to M82 sinking in the west, which was easy to track down in the haze thanks to my twin finders, but it was just a dim smudge without much detail. It did, reassuringly, look considerably better than it does in the 8-inch on nights such as this one, but was certainly no showpiece in the heavy spring haze. One more mosquito bite, and that was it for me. Friday night was supposed to be drier, and I hoped to make it a longer one in hopes of seeing what Zelda would do with a slightly better but still no doubt haze-compromised spring sky. Which I didn’t really get to. Other things intervened Friday night as they sometimes do. I wasn’t too distressed since I planned to take the new telescope out to our club dark site Saturday evening (which I will report on next week). I did stir myself into the backyard at dusk Friday for long enough to check out the extension tube that had arrived in the mail that afternoon. I’d opted for the shortest one Scopestuff sells in 2-inch format, one 35mm in length. Unfortunately, while it brought the 8mm Ethos to focus, its presence meant my other 2-inch oculars were now placed too far back to focus. Sometimes you just can’t win for losing. Since the 8mm Ethos is the only troublesome eyepiece and I’ve got the primary mirror as far back as it will go, I suppose what I will do is dedicate the extension tube to the 8mm, leaving it mated to that ocular rather than in the scope’s focuser at all times. I believe I will prefer to do that rather than use the 8mm in 1.25-inch mode, which has never seemed very secure to me. Oh, well. I suppose I am lucky there’s only one problem eyepiece in my case. So, on to the dark site. While I’d bought Zelda expressly for use in my backyard, I thought she’d be good for club site use, too, since of late I find I have to be really serious about hitting it hard if I am to convince myself to load up the 12-inch and face assembling her at the site and then disassembling her for the trip home. I have become so lazy about my “big” telescope recently, that I’ve been idly thinking Zelda, if she performs as well under a dark sky as I think she will, MIGHT be perfect for some of my star party expeditions too. Maybe. An event where I can leave Old Betsy set up for several days takes away most of the pain of loading her in the vehicle and putting her together on the observing field. Also, she sure is pleasantly compact in the 4Runner when she is taken apart. We shall see. Thanks for your sharing man! I get more knowledge here.. Keep sharing wonderful Article!